Good Morning Aalayam! I want to take a minute to welcome our new readers. Our tribe is slowly growing and we are humbled by the fact that so many of you choose to spend a few minutes of your downtime reading us. Supriya and I constantly struggle with the demands of work, family and the blog and have just not been able to find the bandwidth to take Aalayam to Facebook but we truly appreciate the comments and feedback we get via our posts. Thank you! 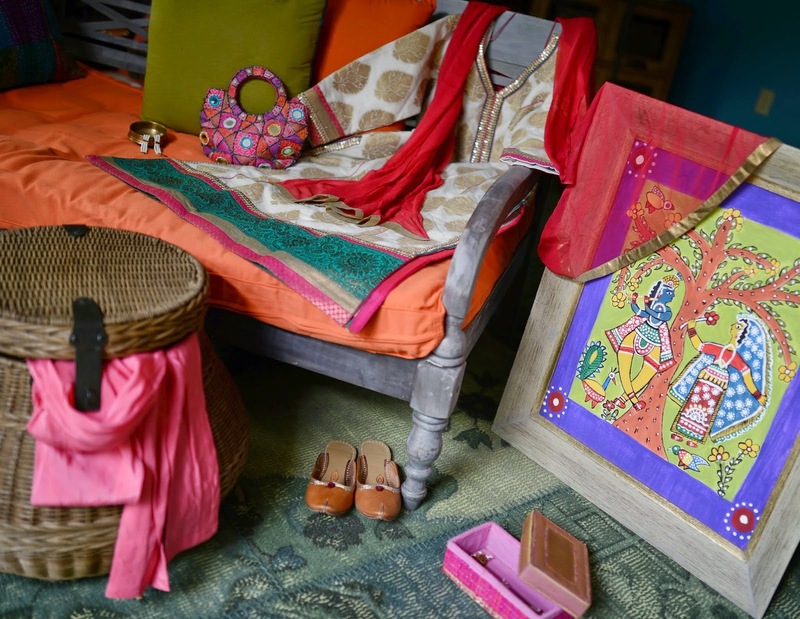 We are going to the next stop on India’s pluralistic folk art trail today. It has been amazing to look at our diverse cultural identity preserved through our folk arts and so far we’ve covered Warli, Tanjore paintings, Kalamkari, Terracotta and more in our incredible India series. We love exploring and discovering India through her art forms. These indigenous art forms tell the story of people living in far-flung corners of India and their lives and their traditions. Folklore comes to life via vivid colors, patterns and the artist’s skill and the art instantly casts a spell on the viewer. Global demand has led to an art revolution of sorts and breathed new life into these art forms even if it means some of these are now mass produced thus compromising their intrinsic handicraft value. I am a huge believer of incorporating moderate doses of handicrafts and local art into my home décor perhaps because of their distinct immutable quality. I am no connoisseur but I do take pride in our rich cultural heritage and hope that via Aalayam I can induce an appetite for India’s folk arts (that have survived the ravages of time) among our readers. 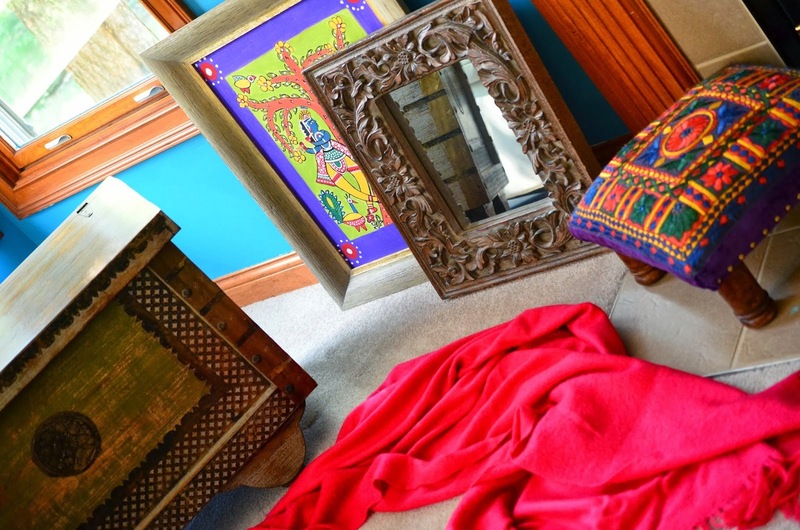 Today, we take a look at a few kitschy corners of my home that house art work in the Madhubani style. I love the rustic simplicity of the Madhubani style of painting so much that I even tried making one. Several dots and details later, my Madhubani was done! It seems perfect inspite of all it’s imperfections and that is the beauty of folk art ! Personally, I feel that navigating the world of folk art is less intimidating than sorting through the sophisticated world of fine art and over the years I have managed to compile a collection of colorful and soulful folk art that is evocative. Of course, the collection is an evolving one as I keep adding to it. In recent years, I have picked up pieces of global folk art as well (talavera, Americana and so forth) and they now adorn quiet corners of our home. The Madhubani or Mithila style of painting is from Nothern India and celebrates mythology, nature, and everyday rituals through the use of bright colors and geometric patterns. You can read more about the evolution of this art form here. Here is a well articulated excerpt (capturing the essence of the Madhubani painting) from an article by Nibedita Das titled Madhubani paintings: Its Existence and Possibility. Good read! So, is folk art a genre of art work that interests you? Does the raw and rustic charm of products created by tribal artisans appeal to your décor sensibilities? If so, are there any particular ones that you are more drawn to and do you have a collection? Write to me or send me pictures. P.S: All images used in this post are from my home and shot by my husband. Please do not use without permission. 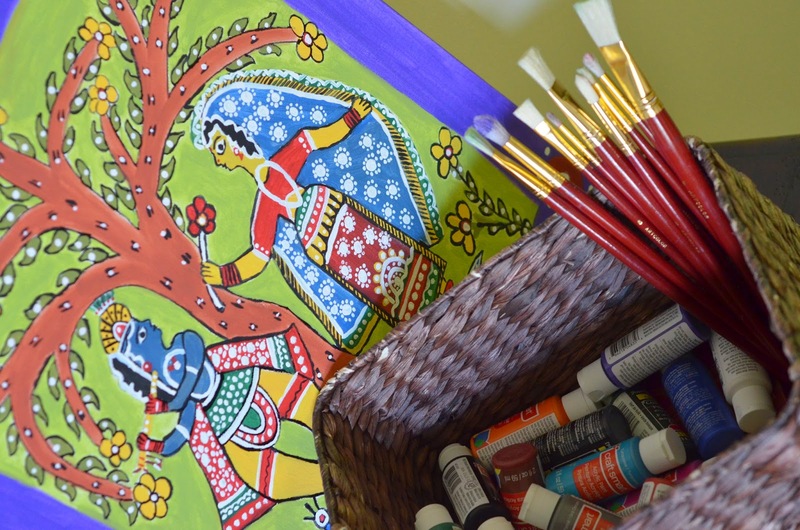 Who doesn't love to have madhubani paintings at home? 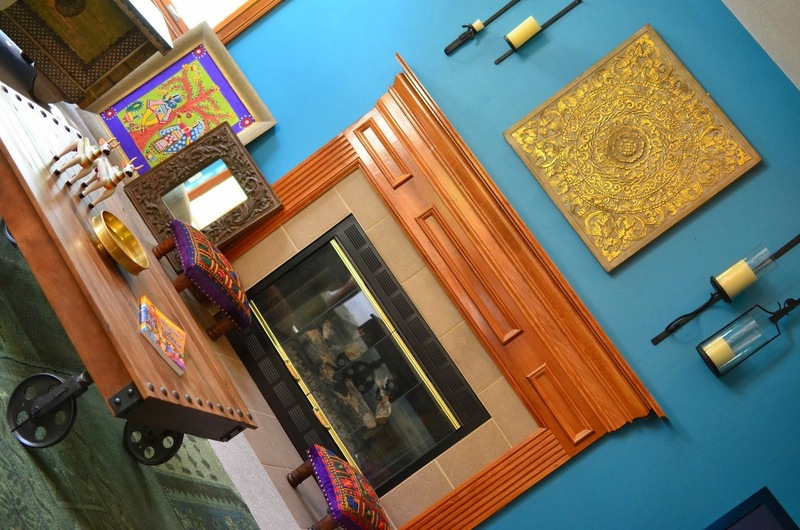 Each piece are riot of colors and brighten any corner. Vasudha: Thanks for stopping by. Absolutely - I call the Madhubani corners of my home, the happy corners! lovely post, enjoyed reading it! Just love reading your blogs. Talking about madhubhani paintings..they are just too amazing. I have started learning madhubha ani frm Jayashree Rao..she is an amazing character.Thank you..good luck ..